With the end of summer literally knocking at my door, I really wanted to whip up one of my favorite summer cookout side dishes. When I was a toddler I would never be seen without an ear of corn in my hand. With or without remaining kernels it was in my hand. I would fall asleep at nap time with it in my hand and my mom would toss it...I'd wake up...freak out....and have to have another. As weird as it sounds, and I know it sounds weird, I just loved it. Still do...creepy nap time corn cob aside. This recipe is super easy, takes less than 10 minutes of prep time and it is a great way to add a little something extra to the old-fashioned staple. Salt and pepper each ear of corn. Wrap each ear of corn with 1 cube of ice tightly in aluminum foil. Roast in an oven or grill at 400 degrees for 50 minutes. 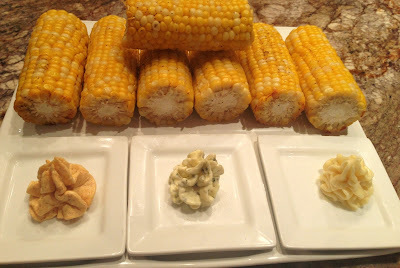 While the corn is roasting whip up the three seasoned butters below to serve alongside the corn. Mix the ingredients for each butter flavor in a small bowl and then you can serve in a small dish or pipe onto a small plate like I did in the photo above. Each butter flavor will accommodate 2 ears of corn so adjust as you wish to make more of your favorites. DELICIOUS!!! Love this one!! Thank you! I like how simple this sounds. So many of the recipes I've come across for corn are very time consuming. The Mexican butter sounds yummy!